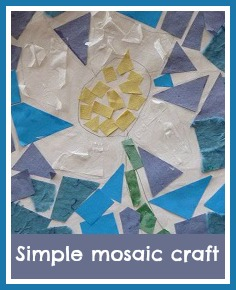 I was really pleased with this simple flower mosaic that I made with Harry. His scissor control is really improving, and I love that as he gets older his attention span is increasing and he is able to finish more complicated projects. I drew around a small plate on some white cardboard and let Harry cut out the circle. Then I drew a flower on some scrap paper for him to copy. We talked about what colours to use and he decided that he wanted to make a daisy, so he drew his design out onto the circle, Then I helped him to cut the coloured paper into small pieces and he glued it into the pattern, using different colours for different areas of the picture. It was so simple to do, and I think it looks really good! This craft would fit in really well with Roman themed activities. 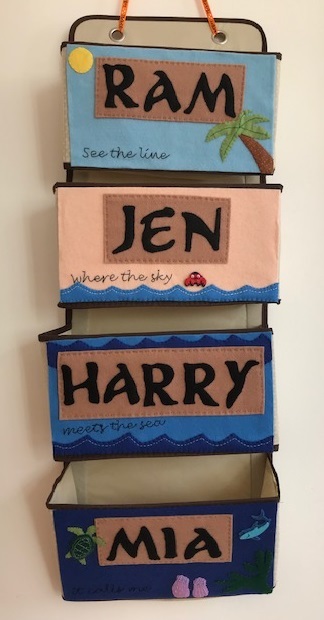 We held a Roman themed day where we also made mosaic style designs using Hama beads, like these Roman mosaic inspired Hama bead border designs. We have also made mosaics for Easter using dyed egg shell pieces, another way of making mosaics that would work really well with this sort of design.